Here is an utterly unique and hugely entertaining selection of the best from the many vintage jazz and popular vocal interpretations from the 30s and 40s of famous classical tunes. There has long been of tradition for popularizing ‘classical’ themes, presenting them in a manner far removed from the concert platform. During the 30s and 40s this practice enjoyed a tremendous vogue, with literally hundreds of popular and jazz records plundering classical composers for material. 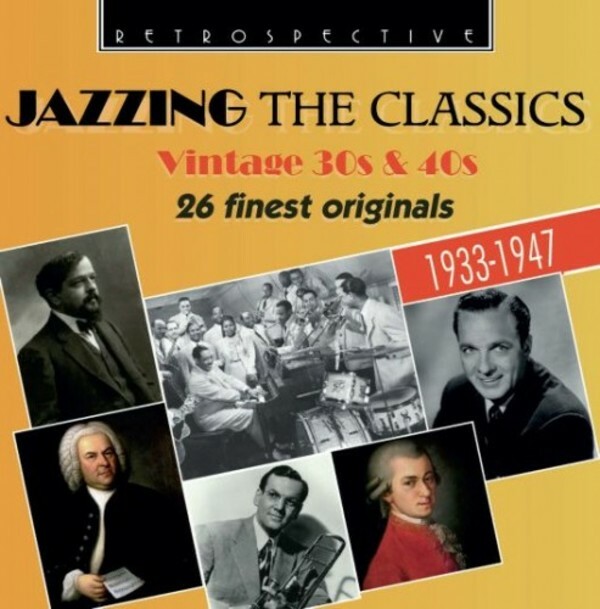 'Jazzing the Classics – Vintage 30s & 40s' offers a kaleidoscopic range of 26 remarkably varied examples. Perhaps after Paul Whiteman it was the big bands that were the main ‘culprits’, and there are examples included here from Glenn Miller (Anvil Chorus and Moon Love from Tchaikovsky’s 5th Symphony), Tommy Dorsey (Liebestraum and Song of India), brother Jimmy Dorsey (Our Love from Romeo & Juliet and with the amazing Josephine Tumminia doing extraordinary things to The Blue Danube), as well as Guy Lombardo, Larry Clinton and the big-band jazz of such as Charlie Barnet and Woody Herman. There’s also remarkable jazz from Art Tatum (phenomenal virtuosity in Massenet’s Elegie), Django Reinhardt and Stephane Grappelli and Eddie South in Bach, and a delightful Skaters’ Waltz from clarinettist Irving Fazola with the Bob Crosby Orchestra. All the top solo artists seemed to feature at least some ‘classical’ material. Prime examples here are Frank Sinatra (a beautiful rendition of Rachmaninov's Piano Concerto No.2 Adagio), Bing Crosby (Grieg's Ich liebe dich), Perry Como (raiding Chopin) and Connee Boswell (making a lovely song out of Tchaikovsky’s Andante Cantabile).